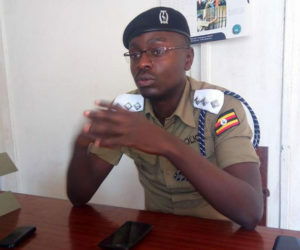 Kampala Metropolitan deputy police spokesperson Luke Owoyesigyire. Photo by Joseph Lyagoba. KAMPALA— Police in Kiira Road have arrested four suspects on allegation of impersonation as Police Officers and extorting money from the public. The four could identify themselves as police officers around Police stations in Kampala and demand money from complainants and suspects in the guise of helping them to get a bond. Kampala metropolitan deputy police spokesman Luke Owoyesigyire has confirmed the incident. Habasa Rogers, 34 years was arrested on December 8, for obtaining Shs5 million from a suspect at Kiira Road Police station. On searching him, Owoyesigyire said Shs4 million was recovered. Another suspect Oketch Oswald Asbert obtained Shs500, 000. Police recovered Shs400,000 from him while Atwine Eddy, 25, obtained Shs 300, 000. The suspects are detained in various Police cells in Kampala. Owoyesigyire has urged the public to be conscious ahead of the festive season.